With a fanciful name like "Devil's Staircase," it's hard to imagine that Congress wouldn't want to protect this amazing, almost mystical waterfall and surrounding forest in Oregon's rugged Coast Range. Indeed, odds for protecting it improved last week when a bill to create the 29,600-acre Devil's Staircase Wilderness made it to the House floor. The legislation, sponsored by Rep. Peter DeFazio, D-Ore., and a companion bill sponsored by Rep. Kurt Schrader, D-Ore., granting wild and scenic designation to the Molalla River, now await votes by the full House. Their anticipated approval will put a nice capstone on a year of major progress in protecting some of Oregon's most unspoiled natural treasures. Last spring, Congress passed the first wilderness expansion in Oregon in 25 years, giving the highest level of protection to Mount Hood forest lands, badlands east of Bend and Soda Mountain and Copper Salmon along the Elk River in southern Oregon. That bipartisan legislation had been stalled for nearly a year, however, after Sen. Tom Coburn, R-Okla., used an arcane parliamentary rule to put a hold on it. Sixty-six senators, led by Oregon's Ron Wyden and Jeff Merkley, finally broke that hold and sent the bill to the White House, where President Barack Obama signed it. 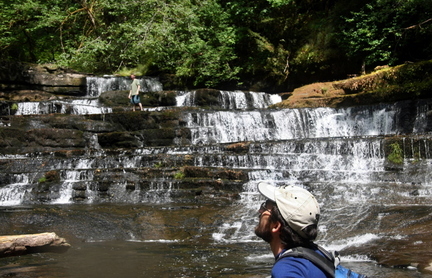 A similar ordeal awaits the Devil's Staircase and Molalla River bills. Wyden and Merkley will once again have to muster help from Senate leaders in overcoming yet another hold by the Oklahoma obstructionist. Coburn couldn't care less about protecting Devil's Staircase, and you can be sure he's never seen it. Few Oregonians have, either. It's that remote -- deep in the steep terrain of the Wasson Creek drainage northeast of Reedsport. Finding the waterfall is quite difficult. Only an experienced hiker should even try it. DeFazio, the congressman from Springfield, meets that qualification. And just about year ago he accompanied two scientists and a conservationist on an arduous mission to find the falls. "Their eyes finally landed on sandstone slabs stacked like pancakes about 50 or 60 feet high," wrote The Oregonian's Katy Muldoon. "They're pocked with plunge pools 5 and 6 feet deep, carved when basalt rocks caught in whirlpools bored ruts in the sandstone." The surrounding forest, too steep for logging, is a fairyland of old-growth timber, gigantic ferns and swamplands. It's a remarkably wild place worth protecting, as is the Molalla River, a recreational gem and source of pristine drinking water for thousands of Oregonians.